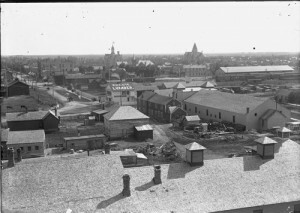 By the turn of the twentieth century, Fargo’s commercial business structures signaled a meaningful transition from the early structures. While the settlers were concerned with the immediate and practical applications, the growing city began to reflect a higher culture and advancing lifestyle on the Northern Plains. Simple utilitarian structures gave way to the buildings that served thriving businesses at the heart of a growing city. As Fargo’s businesses continued to grow, evolve, and improve despite several setbacks, so too did the municipal amenities that ultimately cemented the city’s presence on the plains. Stacy M. Reikowsky is a Ph.D. Student of History and Graduate Assistant in the Department of History, Philosophy, and Religious Studies at North Dakota State University, Fargo. Her studies focus on the influence of the Northern American Plains on twentieth-century civil rights and race progress. She is an avid equestrian and running enthusiast.